New Housing Price Index — N.L. New Housing Price Index — P.E.I. New Housing Price Index — N.S. New Housing Price Index — N.B. New Housing Price Index — Que. New Housing Price Index — Ont. New Housing Price Index — Man. New Housing Price Index — Sask. New Housing Price Index — Alta. New Housing Price Index — B.C. Canadian new house prices remained unchanged on a national basis in May, for a third consecutive month. New housing prices were flat or declined in 15 of the 27 census metropolitan areas (CMAs) surveyed in May. Recent mortgage rate hikes, along with tighter mortgage regulations, may have slowed the demand for new homes. 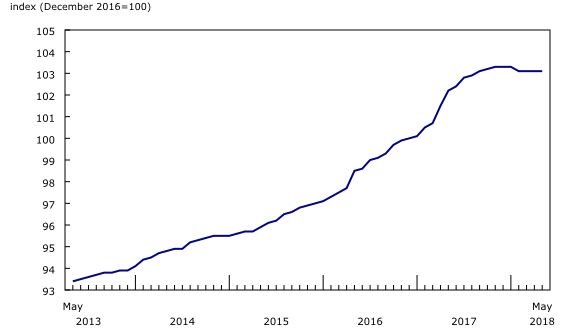 The Bank of Canada reported that the rate for a conventional mortgage on a five-year term increased from 5.14% to 5.34% in May. Toronto new home prices were unchanged in May, following four consecutive months of declines. The Canada Mortgage and Housing Corporation reported that, year to date, housing starts in Toronto were down 36.2% in May compared with the same period in 2017, reflecting a slower pace of construction for row, single and semi-detached new houses. Overall growth in housing prices in Vancouver has been stalled for five consecutive months. In February 2018, the foreign buyers tax was increased from 15% to 20%, among other measures put in place by the government of British Columbia to address housing affordability. Among the 12 CMAs reporting gains in May, the largest increases were in Guelph, London and Windsor (+0.3% in each). Builders in Guelph attributed the rise to higher construction costs, while builders in London and Windsor cited market conditions as the primary reason for higher prices. Despite the higher new home construction costs reported in several CMAs, increases were partly offset by builders offering incentives, such as promotional packages, rebates, and design credits, to promote sales in slowing housing markets. New house prices rose 0.9% year over year in May. This was the smallest increase since February 2010. 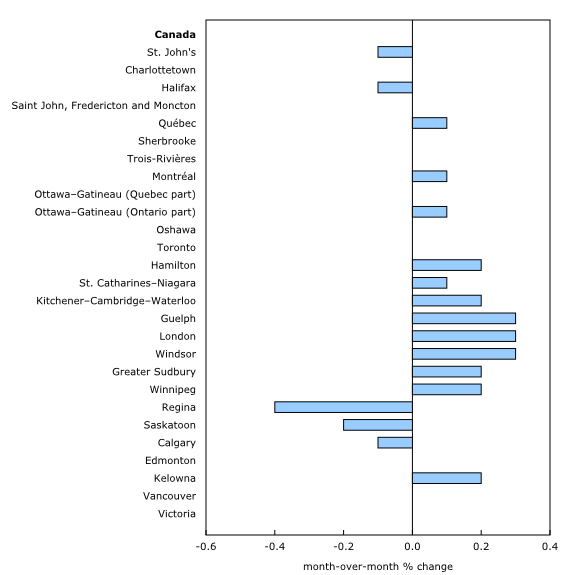 The largest 12-month gains were in Ottawa (+5.2%), Vancouver (+4.8%) and London (+4.6%). Among the five CMAs reporting declines, Saskatoon (-1.4%) and Toronto (-1.3%) recorded the largest 12-month decreases. The New Housing Price Index measures changes over time in the selling prices of new residential houses agreed upon between the contractor and the buyer at the time of the signing of the contract. It is designed to measure the changes in the selling prices of new houses, where detailed specifications pertaining to each house remain the same between two consecutive periods. The survey covers the following dwelling types: single dwellings, semi-detached houses and townhouses or row homes. The current value of the structure is independently indexed and is presented as the house series. The survey also collects contractors' estimates of the current value (evaluated at market price) of the land. These estimates are independently indexed to provide the published series for land. The index is available at the Canada and provincial levels, and for 27 metropolitan areas. The prices collected from builders and included in the index are market selling prices less value-added taxes, such as the federal Goods and Services Tax or the provincial harmonized sales tax. The infographic "Producer Price Indexes at a Glance," which is part of Statistics Canada — Infographics (Catalogue number11-627-M), demonstrates how producer price indexes for goods and services are calculated and why they are important for the Canadian economy. The New Housing Price Index for June will be released on August 9.